No matter your age, laser tag is a fantastic group activity. From kids birthday parties to bachelor parties - the game has been a popular choice for nearly 30 years. The adrenaline pumping game can be played at home, in dimly lit laser tag arenas, outdoors, or in tactically laid out battlefields. Just like any other sport or game, it's always more fun to win. In this article we are going to give you a whole bunch of tips and tricks for success. These tips will give you a ton of things to think about before hand. Show up prepared, and you WILL have a better result. In the end you'll surely come out the winner and be able to bask in the glory of laser tag champion. Lets roll our sleeves up and get started! Before we dive into the tips and tactics, lets set the stage. 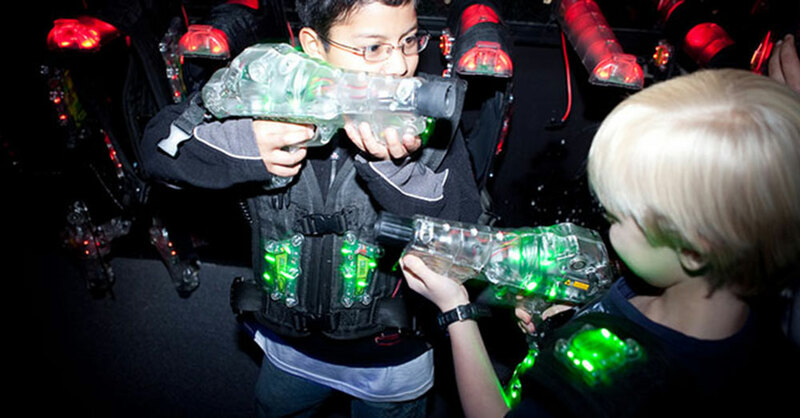 There are a wide variety of arenas and types of laser tag games out there. You'll want to know what you're getting yourself into before you book. The most common type of laser tag on the market is found at your local family fun center. These arenas are usually dimly lit with black-light or accent lighting throughout. Because they are family oriented, you'll often find a wide age range there. Adults and kids will often play together. If you're looking to keep age groups separate, you'll likely want to call ahead and make sure that you can book a private group session. This is a good idea if you're planning an event like a large birthday or bachelor party. On the flip side, it can also be an oddly fun date night to go with your partner and battle a wild group of 4th grade girls. Up to you, just know what to expect. My uncle always used to say: proper preparation prevents poor performance. Boring, but true. By considering these 5 tips before you play, you're setting yourself up for a successful game. It's easy not to listen to the rules when the action is about to begin - especially for smaller children. Learning the rules will keep you from facing issues during the game. There is nothing worse than being given a penalty or being removed from the game due to a rule violation you didn't know about. So this one is simple, learn the rules and follow them. You need to understand how your equipment works before you enter the arena. Know your blaster, how to reload, how to change settings etc. Know where your sensors are and if different sensors result in different scores or damage. Use this information in both offensive and defensive ways. Protect your sensors, know how to effectively fire, and aim for high damage. Getting lost is the worst, especially in a dimly lit arena. If there is a map of the play area, study it in depth. Know where the obstacles are. Understand if there are multiple levels and what the advantages or disadvantages of each are. All of this will keep you moving effectively and finding the best cover. In addition to knowing the map, it's also important to be able to communicate position with teammates. One simple trick is to name the few major landmarks. Pick some easy to remember names so that mid-battle you can call out "MEET AT THE HORSESHOE!" and your team knows where to scramble. Often laser tag games will split players into teams. Before you start, devise a strategy, a plan of attack. Communicating with your teammates will give you a very big edge over an unorganized team. Use the team to cover all your angles and keep eyes out in all directions. This one is easy to overlook, but it can give you a slight edge. Understand that you're visual appearance can help you hide or blend in with the arena. So if you'll be playing in a dark arena, be sure to wear dark clothing. It should also be said that wearing good tennis shoes is essential. Laser tag is an active game. Being quick on your feet makes all the difference. By pre-planning, you're setting yourself up correctly. By keeping a cool head and utilizing well thought out tactics during the game, you'll be shooting to the top of the leader board. The following tips will ensure your team has the best chance of success. Choose positions with no exposure from behind. Work together as a team to watch each others backs. By minimizing the chance of a surprise attack from the side/back, you'll stay alive longer and take less damage. Its inevitable that you'll come under fire. Once you do, minimizing the amount of damage you take makes all the difference. By knowing where your hit sensors are and using proper cover, you can quickly duck, bob, drop or turn sideways to minimize the amount of damage you take. Keep returning fire while you make a defensive move, find cover, and calm the situation down before proceeding. If you know an enemy is just around a corner, we recommend coming out guns blazing. It's best to be firing as you expose yourself rather than jump out, wait, then fire. By aiming through your cover and firing as you expose yourself, you create some cover for yourself. As you spot the enemy, adjust your aim - just be sure to watch your ammo levels. In two-level arenas, the upper and lower levels require different tactics. Lower levels are more high action close combat battles while the upper level serves as more of a slow paced sniper's nest. Understanding these tactics can help you fight appropriately in each situation. When playing as a team, sometimes it makes sense to stay together, sometimes its better to split up. Especially in tight quarters, splitting for a two or three sided ambush can be highly effective. When the defending team doesn't know where the hits are coming from, it can create some very effective chances to score! We would give you some post-game tips, but how you celebrate is completely a personal choice. Gloat, rub it in, do a victory dance? Its up to you. We hope these tips have helped you become the master of the arena. Stop back by after your win and let us know how it went in the comments below. Also let us know if you have any other helpful tips that we missed! I like your tip about checking where your sensors are for a game of laser tag. I will keep these tips in mind when I am playing with my family next week. We are looking to find a venue for a family anniversary. It's probably a good idea to check the website of a venue before using it.